Natural Tahini Premium Quality Sesame Seed Paste is made from ground, hulled Humera Sesame Seeds. Widely used in North African, Middle Eastern, Greek and Turkish cuisine, it is served as a dip on its own, or used to make a dressing, or as an essential ingredient in Houmous or Baba Ganoush. Tahini can be used as a sauce to drizzle over Falafel, Salads or Wraps. It is also the main ingredient in traditional halva, a fudgelike Tahini-based dessert popular across the Arab world. Roasting vegetables with Tahini can also give them a delicious nutty flavour. 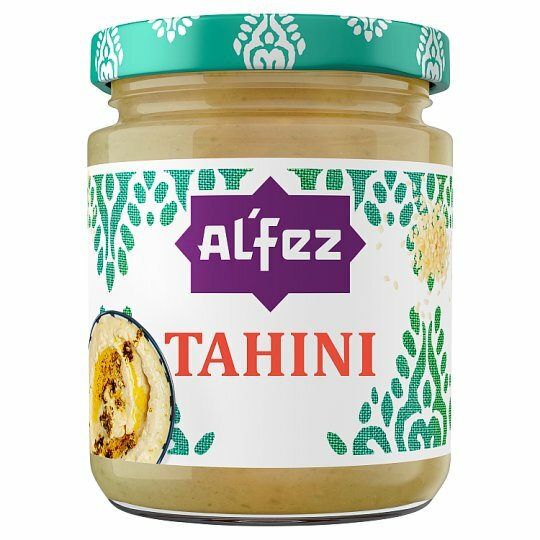 Or try using Tahini in a more contemporary way - because of its smooth, rich flavour, it can be spread on toast as an alternative to Peanut Butter or drizzled into porridge. It can also be used to make vegan fudge or added to desserts as a dairy-free way to make them creamier. Premium quality sesame seed paste, ready to use, no added sugar, no added salt. Natural Tahini is free from wheat, gluten and dairy, suitable for vegetarians and vegans. Al'Fez is the leading Moroccan & Middle Eastern food brand and we have put together a delightful selection of North African and Middle Eastern inspired products for you to enjoy. Sauces, dressings, spice blends and core ingredients help you to quickly and easily recreate Moroccan and Lebanese classics: from tagines to spiced couscous and delicious falafel to aromatic kebabs. Discover a whole new world with Al'Fez. Mix thoroughly 1/2 jar Tahini, 1/4 cup water, 1 tsp lemon juice, 1 crushed garlic clove, salt/pepper to taste. Tip! Adjust water/Tahini for required consistency. Separation is a natural occurance. Stir well before use.